Explore the number of weather records broken over recent periods. Compare counts of high maximum, high minimum, low maximum, and low minimum temperature records as well as records for precipitation, snowfall, and snow depth in the United States or across the globe. Be aware that these counts can provide insight into recent climate behavior, but they do not offer a definitive way to identify trends in the number of records set over time. Broken and tied records counted or displayed by this tool are compiled from a subset of stations in the Global Historical Climatological Network. For a station to be counted as having broken or tied a record, it must have a minimum of 30 years of observations for that variable, with more than 182 days complete during each of the 30 years. Examine charts on the View Records Summary tab to compare counts of broken or tied records in the United States and around the world. Compare the ratios of different types of temperature records (High Max vs. Low Min, for example) to look for trends. Are more warm records being set than cold records? 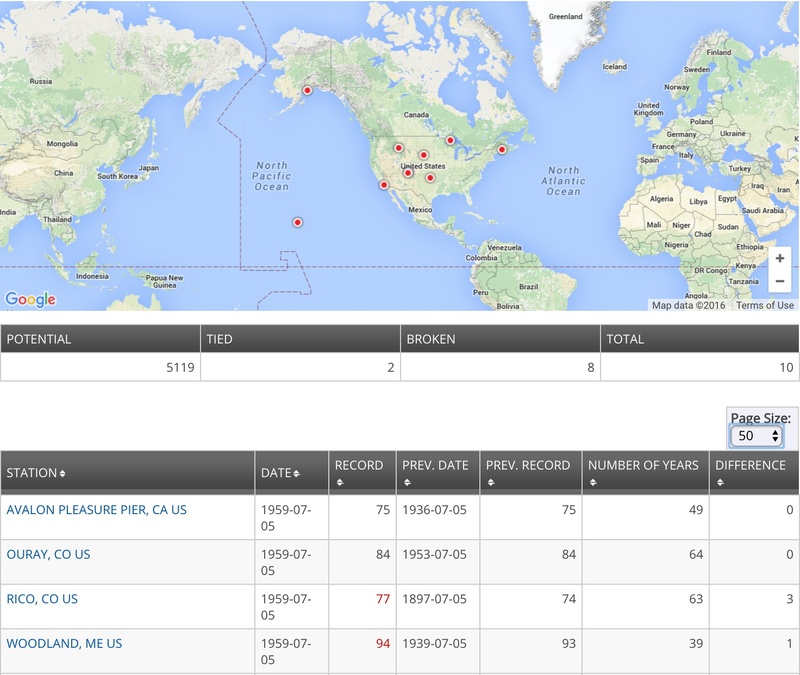 Use the View Selected Records tab to identify record-setting events on a map and in a table. Compare recording-setting values to their previous values. On the View Records Summary tab, select U.S. Summaries or Global Summaries, and then scroll down to view the charts. On the View Selected Records tab, use the drop-down menus to select a timescale, location, and date range, and parameters of your search. If records were broken (or tied) at valid station within the selected date range, the map will show locations where the record was set. A table descriging the broken (or tied) records will appear below the map. Locator Daily Weather Records Summaries provide counts of broken or tied records. Use the View Selected Records to examine record-breaking details. Text above the tool tabs describes the criteria for stations to have their observations considered as new records.